Figure A. RPE conjugated Mouse anti Chicken CD8 (MCA2166PE) and Mouse IgG1 isotype control (MCA928) conjugated with Goat anti Mouse IgG (H/L):FITC (STAR117F). Figure B. Mouse anti Chicken CD3 (MCA1473) conjugated with Goat anti Mouse IgG (H/L):FITC (STAR117F) and RPE conjugated Mouse anti Chicken CD8 (MCA2166PE). All experiments performed on peripheral blood mononuclear cells extracted from whole chicken blood gated on lymphocytes. Data acquired on the ZE5™ Cell Analyzer. 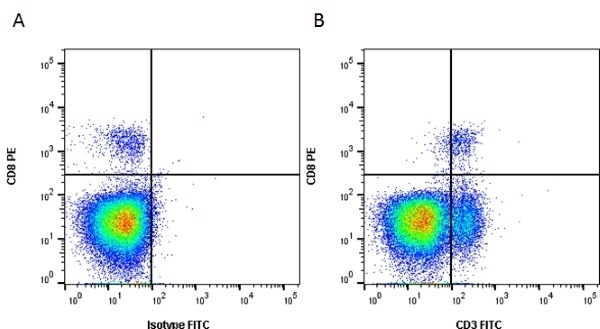 Figure A. FITC conjugated Mouse anti Chicken CD4 (MCA2164F) and Mouse IgG1 isotype control (MCA928) conjugated with Rabbit F(ab')2 anti Mouse IgG:RPE (STAR12A). Figure B. 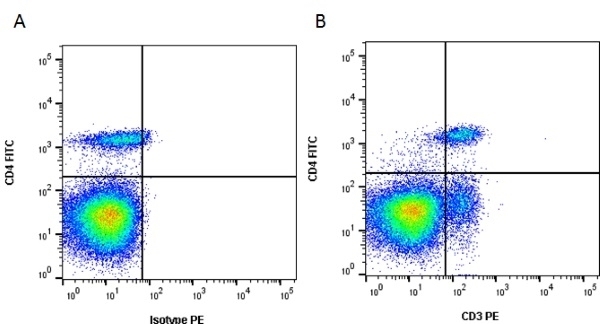 Mouse anti Chicken CD3 (MCA1473) followed with Rabbit F(ab')2 anti Mouse IgG:RPE (STAR12A) and FITC conjugated Mouse anti Chicken CD4 (MCA2164F). All experiments performed on peripheral blood mononuclear cells extracted from whole chicken blood gated on lymphocytes. Data acquired on the ZE5™ Cell Analyzer. Figure A. FITC conjugated Mouse anti Chicken CD8 (MCA2166F) and Mouse IgG1 isotype control (MCA928) conjugated with Rabbit F(ab')2 anti Mouse IgG:RPE (STAR12A). Figure B. Mouse anti Chicken CD3 (MCA1473) followed with Rabbit F(ab')2 anti Mouse IgG:RPE (STAR12A) and FITC conjugated Mouse anti Chicken CD8 (MCA2166F). All experiments performed on peripheral blood mononuclear cells extracted from whole chicken blood gated on lymphocytes. Data acquired on the ZE5™ Cell Analyzer. 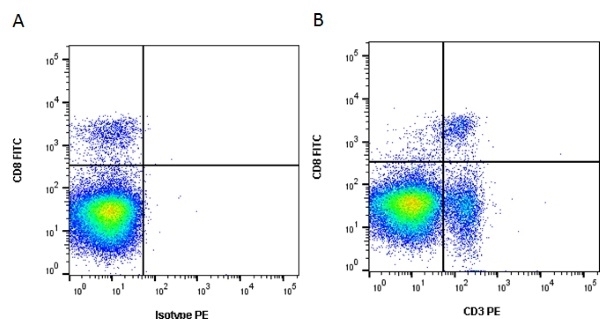 CD3 antibody, clone CT-3, recognizes the chicken CD3 and is expressed by approximately 30% of thymocytes, 70% of peripheral blood mononuclear cells, but <1% of cells in the bursa and bone marrow. Mouse anti Chicken CD3, clone CT-3 recognizes the chicken CD3 cell surface antigen expressed by T cells (Chen et al. 1986). The antibody also co-precipitates a ~90 kDa heterodimer from digitonin solubilised T cell lysates, which can be reduced to two polypeptides of ~40 kDa and ~50 kDa. In the chicken, CD3 is expressed by approximately 30% of thymocytes, 70% of peripheral blood mononuclear cells, but <1% of cells in the bursa and bone marrow. Chicken thymocytes and Ig -ve peripheral blood mononuclear cells. Lymph node cells from immunised Balb/c mice were fused with cells from the mouse P3-X63Ag8.653 myeloma cell line. Chen, C.L. et al. (1986) Identification of a T3/T cell receptor complex in chickens. J Exp Med. 164 (1): 375-80. Mukamoto, M. & Kodama, H. (2000) Regulation of early chicken thymocyte proliferation by transforming growth factor-beta from thymic stromal cells and thymocytes. Vet Immunol Immunopathol. 77 (1-2): 121-32. Chaussé, A.M. et al. (2011) Expression of toll-like receptor 4 and downstream effectors in selected cecal cell subpopulations of chicks resistant or susceptible to salmonella carrier state. Balic, A. et al. (2014) Visualisation of chicken macrophages using transgenic reporter genes: insights into the development of the avian macrophage lineage. Journal of Animal and Feed Sciences. 24 (2): 127-33.